My friend Tess's son was recently married. She created these romantic tabletop centerpieces for the dress rehearsal dinner but I'm definitely imagining them for the wedding itself and other occasions. Tess used lanterns from Pier 1. The florist created the floral rings for them which had the same roses found in the bride's bouquet. 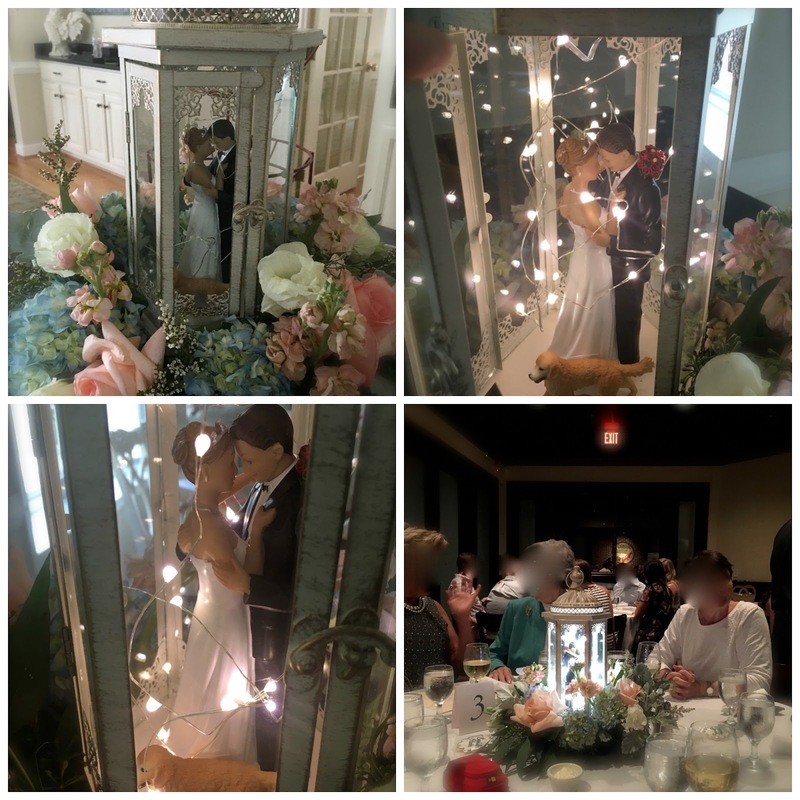 The Bride and Groom figurines are a cake topper from Target and the dog figurine is made by Schleich (they make a lot of farm animal figurines) that she ordered on-line because she had a lot to order but they can be found in various places including Walmart and Tractor Supply. The little LED lights were also from Pier 1 and the battery box is taped to the upper part of the lantern. I love how she included the couple's golden retriever (Maverick). Such a nice personal touch! For privacy I blurred out the faces of her guests. This was the only picture she had on hand from that evening showing the centerpiece. You know how it is- when you are hosting a party you barely have time to remember such things! This is such a pretty idea- I love how romantic it is! Please feel free to Pin on Pinterest! This is truly a lovely centerpiece just perfect for a reception or any fabulous celebration! Can't imagine how she could have anything nicer. It's great idea - thanks for sharing! These are really pretty and I bet they would be great for the actual wedding too. These are super cute, Liz! This is hands down one of the most creative centerpieces I've ever seen...and I've seen a lot!!! Beautiful! Liz, these are gorgeous centerpieces! Your friend was very creative in her selections! Very sweet centerpiece . Love the fairy lights. How special for them. Creativity was stunning. Beautiful and yes romantic centerpiece. Just gorgeous. Gorgeous centerpiece! Thanks for sharing this Liz! That cake topper is so very sweet and love how they included the dog! Very pretty and elegant! Love the flowers around it and the lights inside the lantern.